It’s time to register for the annual Trail to a Cure Ride/Walk/Run! The details are largely explained here. But we get questions. Here are some answers! The TTAC_Event_Participant_Packet has 99% of what you need to know to participate. What time does the big Ride/Walk/Run event start? That depends upon the event selected. Trailside set up at the Rocheport trailhead starts around 8 am. After 2 pm, everything moves up the trail a tiny bit to the Rocheport City Park where there is live music, food, beverages, raffles, and other exciting things. This is a great time for the family/friends of participants who don’t ride/walk/run to join them for a great celebration! Ride-50 miles from Rocheport to Hartsburg round-trip; start at 9:00, finish at ~2:00. Run-1/2 Marathon (13.1 miles) from Rocheport to Huntsdale round-trip; start at 10:30, finish at ~2:00. Ride-32 miles from Rocheport to Cooper’s Landing (near Easley) round-trip; start at 10:30, finish at ~2:00. Walk-10K from Rocheport to Maggie/Angie’s Stop, round trip; start at 11:30, finish at ~2:00. Ride-18 miles from Rocheport to McBaine round-trip; start at 12:00, finish at ~2:00. Run-10K from Rocheport to Maggie/Angie’s Stop, round trip; start at 12:30 finish at ~2:00. Walk-5K from Rocheport to I-70, round trip; start at 12:45, finish at ~2:00. Run-5K from Rocheport to I-70, round trip; start at 1:00, finish at ~2:00. How does this event work? New to our event? Perhaps the Route_Map will help you to orient yourself. The ride/walk/run is a unique event. All event types/distances take place simultaneously on the trail (a former railway that runs alongside the Missouri river). The course is relatively flat, and is primarily made up of gravel. It’s a rain or shine event, and the event is a round-trip (there and back again?) 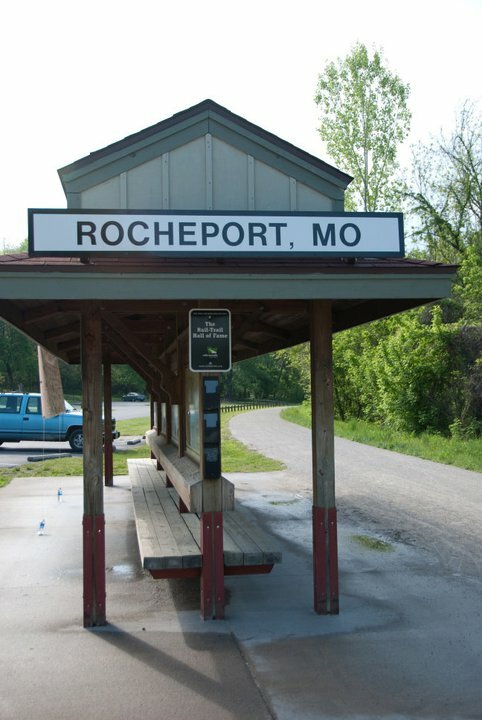 format starting and ending at the Rocheport Trailhead of the Katy Trail. Running events are timed. Results are posted via Webscorer Pro. Register for the Ride/Walk/Run on the first Saturday in May. Discounted, advance registration ends the day prior to the event at 5 pm. Save money and register now! Can’t raise $100 from friends and family? You are more than welcome to make a tax-deductible donation to cover the difference or whatever you can afford in addition to the registration fee that helps cover costs. Our primary purpose as an organization is to raise funds for HIV/AIDS research and services–anything you can do to help us meet our mission is greatly appreciated! See you on the trail! Please print out the flyer today and put it in your car or on your fridge or save it in your calendar on your phone. 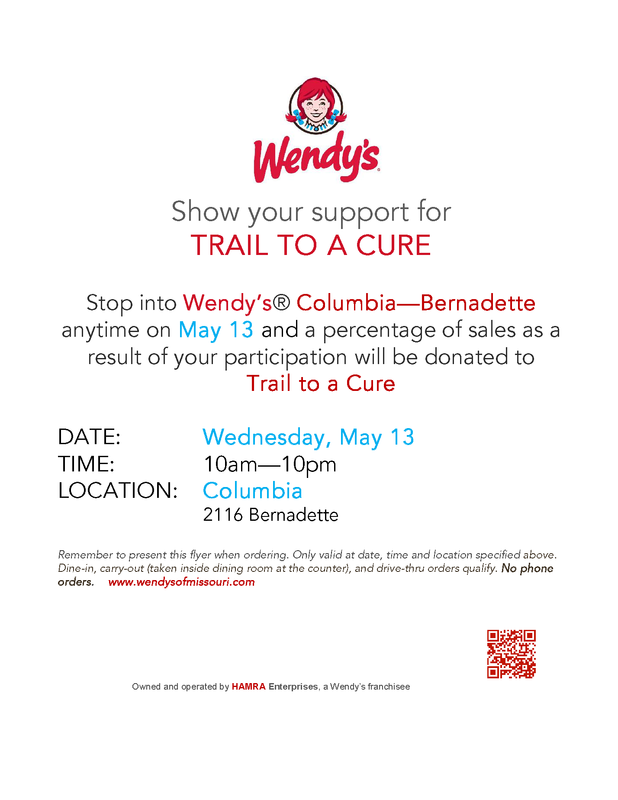 You can help Trail to a Cure by dining at the Wendy’s location on Bernadette in Columbia on May 13th! Thanks for joining us on the trail to a cure! We care about making a difference in the HIV/AIDS crisis–yes, it is still a crisis. We need a cure. We need better treatments, and we need more progress. 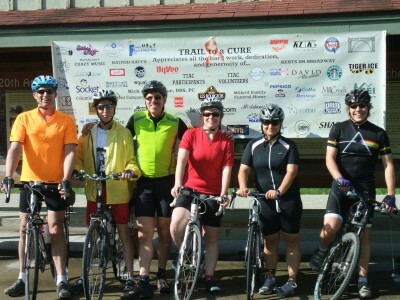 Trail to a Cure (TTAC) has been raising funds to fight HIV/AIDS since 2007. Our main event is the ride/walk/run that we hold every year on the first Saturday in May. We have always passed along both the fundraising money that event participants bring in and their registration fees (plus a tad more) to our beneficiaries: nonprofits who are working to FIGHT AIDS! CHALLENGE! We have been challenged by our loyal sponsors at AccurateRX to match their sponsorship of $500. We have 2 weeks to do it. We know you care about HIV/AIDS as much as we do. 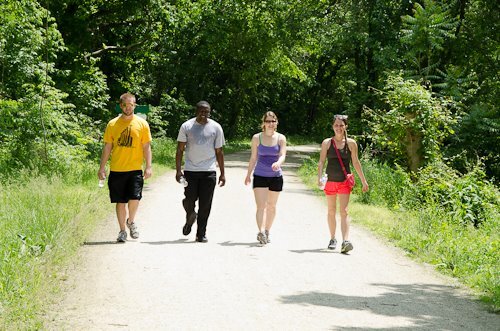 And we know that you enjoy a consistently good ride/walk/run every year in Rocheport. 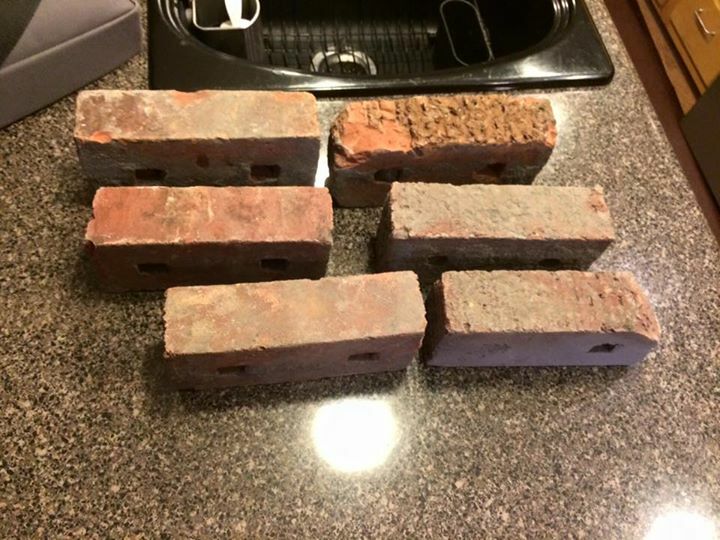 Can you contribute $50? Or, any amount will help! We would love to show our sponsors that we can leverage their support to do even more than we would otherwise. So we are confident that you want to be a part of achieving this goal with us. Am I right? DO IT! It’s easy. Before February 1st, make an online contribution to TTAC, and your support will count in our challenge. Do it in MEMORY of someone lost to HIV/AIDS. Do it in HONOR of someone living with HIV/AIDS. Do it in HOPE of a cure–right now. Your contribution helps provide services such as food vouchers to those living with HIV/AIDS in central Missouri. Your contribution helps put more undergraduate and graduate students in labs of the HIV/AIDS researchers at MU’s Bond Life Sciences Center — casting the net wider for better treatments or even a cure. Your contribution helps amfAR, the Foundation for AIDS Research fund promising research that might not otherwise get done. Thank you for your support. Your donation is tax deductible. 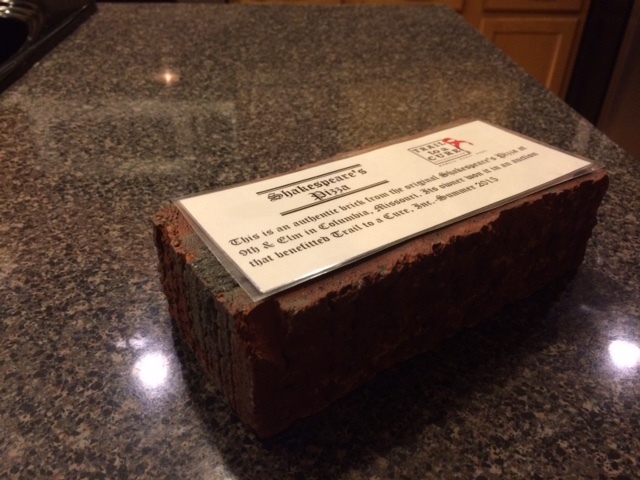 And thank you to AccurateRX for your support of Trail to a Cure and for issuing this challenge to our supporters! 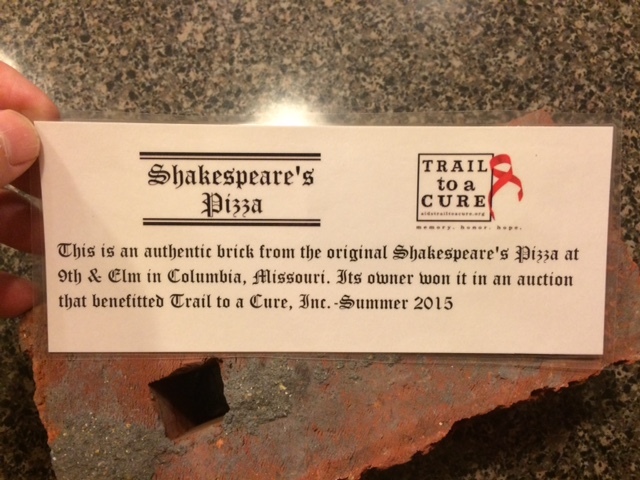 Why do we do Trail to a Cure? Check out this tool to understand. Note: Trail to a Cure does not have any formal relationship with the people at AIDSVu. We are sharing this as a resource.